Smoko knows just how to bring a smile to your inner child. The Giant Unicorn Lamp isn’t just the most adorable thing you’ll ever see, it also features a modern, sophisticated design that makes it a great accessory for your living space. Made from heat-resistant polyethylene, it is a solid, heavy-duty addition to any home. While gigantic, it is also highly compact, and can fit snugly on your bedside table, study desk, or any other convenient surface. The lamp emits a soft glow in the dark, enough to let you read your favorite bedtime novel or do some late-night browsing, but not bright enough to irritate your eyes. And that’s not all—the lamp is fitted with a myriad of LED lights and comes with a remote control that lets you switch between 16 dazzling colours. Fancy a gentle green glow? How about a soft blue glimmer? Or perhaps a fiery red spark? All possible with the simple click of a button! 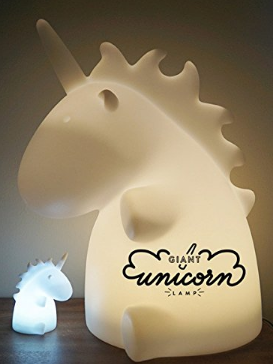 The Giant Unicorn lamp is designed with cutting-edge technology, emitting soothing rays that don’t cause strain on your eyes and actually help improve your mood. Get one here on Amazon!